I'm at Google this summer (Google summer internship round #2) because its where the data is. 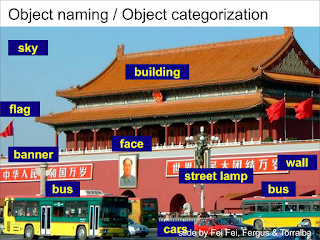 If you want to recognize objects from images you need to learn what objects look like. 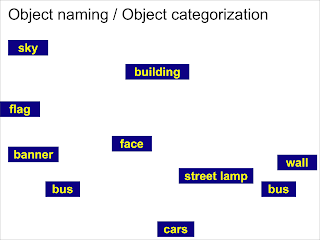 If you want to learn what an object looks like you need to have many examples of that object. You then feed those instances into an algorithm to figure out its essence -- what it is about that object's appearance that makes it that object. Google has the data and Google has the infrastructure to process that data, so I'm there for the summer. I previously mentioned Shimon Edelman in my blog and why his ideas are important for the advancement of computer vision. Today I want to post a review of a powerful and potentially influential 2009 piece written by Edelman. Shimon Edelman, On what it means to see, and what we can do about it, in Object Categorization: Computer and Human Vision Perspectives, S. Dickinson, A. Leonardis, B. Schiele, and M. J. Tarr, eds. (Cambridge University Press, 2009, in press). Penultimate draft. I will refer to the article as OWMS (On What it Means to See). The goal of Edelman's article is to demonstrate the limitations of conceptual vision (referred to as "seeing as"), criticize the modern computer vision paradigm as being overly conceptual, and show how providing a richer representation of a scene is required for advancing computer vision. Edelman proposes non-conceptual vision, where categorization isn't forced on an input -- "because the input may best be left altogether uninterpreted in the traditional sense." (OWMS) I have to agree with the author, where abstracting away the image into a conceptual map is not only an impoverished view of the world, but it is not clear whether such a limited representation is useful for other tasks relying on vision (something like the bottom of Figure 1.2 in OWMS or the Figure seen below and taken from my Recognition by Association talk). 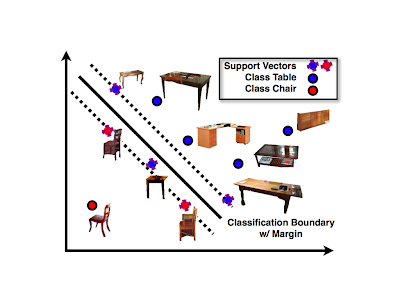 "Seeing as" is a non-invertible process that abstracts away visual information to produce a lower dimensional conceptual map (see Figure above), whereas "seeing" provides a richer representation of the input scene. Its not exactly clear what is the best way to operationalize this "seeing" notion in a computer vision system, but the escapability-from-formalization might be one of the subtle points Edelman is trying to make about non-conceptual vision. Quoting Edelman, when "seeing" we are "letting the seething mass of categorization processes that in any purposive visual system vie for the privilege of interpreting the input be the representation of the scene, without allowing any one of them to gain the upper hand." (OWMS) Edelman goes on to criticize "seeing as" because vision systems have to be open-ended in the sense that we cannot specify ahead of time all the tasks that vision will be applied to. According to Edelman, conceptual vision cannot capture the ineffability (or richness) of the human visual experience. Linguistic concepts capture a mere subset of visual experience, and casting the goal of vision as providing a linguistic (or conceptual) interpretation is limited. The sparsity of conceptual understanding is one key limitation of the modern computer vision paradigm. Edelman also criticizes the notion of a "ground-truth" segmentation in computer vision, arguing that a fragmentation of the scene into useful chunks is in the eye of the beholder. To summarize, Edelman points out that "The missing component is the capacity for having rich visual experiences... The visual world is always more complex than can be expressed in terms of a ﬁxed set of concepts, most of which, moreover, only ever exist in the imagination of the beholder." (OWMS) Being a pragmatist, many of these words resonate deeply within my soul, and I'm particularly attracted to elements of Edelman's antirealism. I have to give two thumbs up to this article for pointing out the flaws in the current way computer vision scientists go about tackling vision problems (in other words researchers too often blindly work inside the current computer vision paradigm and do not often enough question fundamental assumptions which can help new paradigms arise). Many similar concerns regarding Computer Vision I have already pointed out on this blog, and it is reassuring to find others point to similar paradigmatic weaknesses. Such insights need to somehow leave the Philosophy/Psychology literature and make a long lasting impact in the CVPR/NIPS/ICCV/ECCV/ICML communities. The problem is that too many researchers/hackers actually building vision systems and teaching Computer Vision courses have no clue who Wittgenstein is and that they can gain invaluabe insights from Philosophy and Psychology alike. Computer Vision is simply not lacking computational methods, it is gaining critical insights that cannot be found inside an Emacs buffer. In order to advance the field, one needs to: read, write, philosophize, as well as mathematize, exercise, diversify, be a hacker, be a speaker, be one with the terminal, be one with prose, be a teacher, always a student, a master of all trades; or simply put, be a Computer Vision Jedi. While initial musings (and some early theories) on Categorization come from Philosophy (think Categories by Aristotle), most modern research on Categorization which adheres to the scientific method comes from Psychology (Concept Learning on Wikipedia). Two popular models which originate from Psychology literature are Prototype Theory and Exemplar Theory. Summarizing briefly, categories in Prototype Theory are abstractions which summarize a category while categories in Exemplar Theory are represented nonparametrically. While I'm personally a big proponent of Exemplar Theory (see my Recognition by Association CVPR2008 paper), I'm not going to discuss the details of my philosophical stance in this post. I want to briefly point out the shortcomings of these two simplified views of concepts. Researchers focusing on Categorization are generally dealing with a very simplified (and overly academic) view of the world -- where the task is to categorize a single input stimulus. The problem is that if we want a Theory of Concepts that will be the backbone of intelligent agents, we have to deal with relationships between concepts with as much fervor as the representations of concepts themselves. While the debate concerning exemplars vs. prototypes has been restricted to these single stimulus categorization experiments, it is not clear to me why we should prematurely adhere to one of these polarized views before we consider how we can make sense of inter-category relationships. 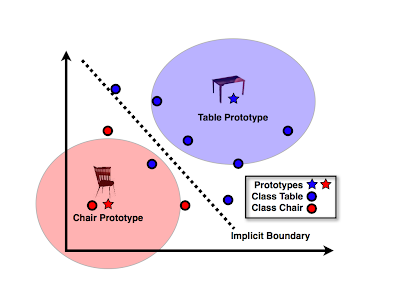 In other words, if an exemplar-based view of concepts looks good (so-far) yet it is not as useful for modeling relationships as a prototype-view, then we have to change our views. Following James' pragmatic method, we should evaluate category representations with respect to a larger system embodied in an intelligent agent (and its ability to cope with the world) and not the overly academic single-stimulus experiments dominating experimental psychology. On another note, I submitted my most recent research to NIPS last week (supersecret for now), and went to a few Phish concerts. I'm driving to California next week and I start at Google at the end of June. I also started reading a book on James and Wittgenstein.